"It's great to be alive at St. Anne's!" We have recently updated our website, and now The St. Anne’s Scoop will be hosted on that site. Here is the new url. I just finished mixing up my dough. In the almost six years that I’ve been here at St. Anne’s, it’s become tradition that I make hot cross buns to serve for our residents’ snack on Holy Thursday afternoon. Actually, they have traditionally been a food for Lent and Good Friday especially. However, serving a special homemade treat seems more appropriate, to us here, for Holy Thursday rather than during the solemn fasting of Good Friday. Also, Holy Thursday is the day we gratefully remember the first Eucharist, when Christ gave the “Bread from Heaven” for the first time. To me, it seems fitting that residents enjoy these little breads on that day. 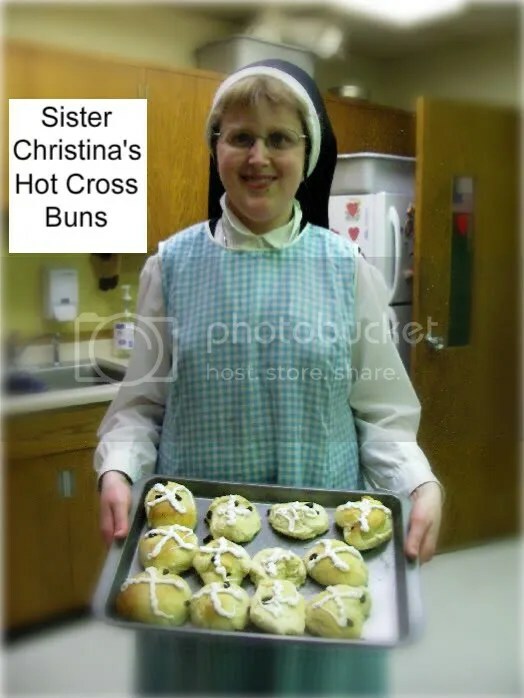 I’d like to share some history about Hot Cross Buns which I found some years back. I regret that I no longer have the source(s) to document. One source noted the Christian roots in the 1100s when a monk placed the sign of the cross on buns to honor Good Friday, known at that time as the “Day of the Cross.” Another source dates this event to the 1300s. “Hot cross buns” became popular in England and Ireland, and later in the United States. These buns have an interesting connection with the persecution of Catholics in 16th century England. When Catholicism was banned, people could be tried for “Popery” because they marked the cross on their Good Friday buns. They came up with an excuse for continuing the practice, saying that it was necessary so for the buns to properly rise. One thing connected with this history which I found especially interesting follows: It was a universal custom (and still is in Catholic countries) to mark a new loaf of bread with the sign of the cross before cutting it, in order to bless it and thank God for it. What a neat custom! Several months back, a family from the northwestern Minnesota brought a statue to St. Anne’s. It had come into their possession after it was removed from an area church a few decades back. However, due its large size, they could no longer store it. The family thought we might be able to have it restored. They even gave donations toward the project. A visitor for Adoration who saw it in its poor condition gave us the name of someone who does statue restoration work. They had recently done work at St. Mary’s Church here in Grand Forks. The gentleman, from DeNardo Statuary & Restoration Company, came and took a look at the statue. After a little discussion, he took it and began to work on it. This past week, we saw a familiar face at the front desk. The man was back and had the statue ready. Now, with its beauty restored, the statue of the Sacred Heart stands in the hallway leading to our chapel, welcoming those who pass by. We are not certain how long it will stay there, or if it will find a more permanent home elsewhere, but for the time being, at least, we are enjoying the presence of a special guest here at St. Anne’s Guest Home. One of our apartment residents, Betty Canavan, has graciously supplied us with an article about this famous producer. March 12th is set aside to honor the life, times and work of master filmmaker Alfred Hitchcock. Director of 53 films and a career of 60 years, his television shows and films are every bit as popular today. Among his many accolades were two stars on the Hollywood Walk of Fame. He was Knighted by Queen Elizabeth ll in 1980. His films include: The Birds, Psycho, North by Northwest (filmed at Mt Rushmore), Vertigo, Rear Window, Dial M for Murder and To Catch a Thief. Somewhat of a ham, he made walk on appearances in 39 of his films. During World War ll, he made several fiction spy and non-fiction propaganda films. He put together a Holocaust film with actual footage of camps that was too shocking for the public and remained in vaults until 1985. What made Alfred Hitchcock “the most universally recognized person in the world”? It was his style of using the camera as if it were you, the viewer, trapped in the scene, increasing your anxiety, suspense and fear. Alfred was born above his parent’s grocery in London. He was the youngest of three children. His parents were Roman Catholic, his father a grocer. Alfred enjoyed playing on his own, making up stories. His family moved when he was six and started a fresh seafood sales and fried fish and chips stall, living in the flat above. Alfred started school at Howrah House Convent, then went on to Wode Street School, run by the Faithful Companions of Jesus. At nine, boarding school at Salesian College. The family moved again and, at eleven, it was boarding at St Ignatius College. The Jesuit priests used a hard rubber cane on the boys. It is where Sir Alfred developed a sense of fear and various reactions to it. At thirteen, Alfred told his parents he wanted to be an engineer. He started night classes at the London County School of Engineering but, when his father died unexpectedly, he took a job at Henley Telegraph and Cable Company. Alfred kept up his night classes, including mechanics, electricity, acoustics and navigation, then art history , painting, economics and political science. Hitchcock joined the Royal Engineers during 1917. After World War l, he became manager of The Henley Telegraph. This expanded his creative writing and he said this was his first step toward cinema. Sir Alfred married Alma Reville, a Protestant, who was baptized Catholic within six months and confirmed a month later in Westminster Abbey by Cardinal Francis Bourne. They had one child, Patricia. Alma collaborated with her husband on many projects. His health finally failed him, as did worry for his wife who had a stroke. He died in April 1980, after calling two Jesuit priests to hear his confession and celebrate Mass in his Bel Air home. His funeral was held in Good Shepherd Catholic Church in Beverly Hills. Have you ever been struck by how odd sounding the name is that we use to refer to shredded cabbage covered in vinegar or mayonnaise? During this month when many will enjoy corned beef and cabbage, our residents and staff will continue having coleslaw as part of the regular menu (about once or twice a week). You may ask: how did a term from Holland make its way into common American usage? The answer comes from the Dutch immigrants to New York who brought their cabbage salad recipe with them. Actually, though, something akin to today’s coleslaw dates back as far as the ancient Romans. In fact, the ‘cole’ in cole slaw is similar to the latin, colis, which means cabbage. You will notice the similarity between to kool (cabbage) and the term Kale, which is actually from Scotland. There are variations around the world; many countries have cabbage salads of their own. For example, Germans enjoy Krautsalat, or finely shredded cabbage with an oil/vinegar marinade. It may even have apples or onions in it. In Italy, insalata capricciosa includes cooked ham and sliced pepper. Poles enjoy a number of coleslaw-like dishes, which are often served as a side dish to their second course. These salads include some form of cabbage (often white), as well as minced onions, dill or parsley, shredded carrots, and who knows what else (additional miscellaneous ingredients are often used). In Russia and the Ukraine, sunflower oil is used as dressing, and carrots, apples, cranberries or the like are often added as well. In Sweden, they serve a cabbage salad with vinegar, oil and seasonings and accompanies, of all things, pizza! The British, on the other hand, eat their cabbage salad with mayonnaise or salad cream and sometimes include cheese, nuts, or dried fruits. The purpose of our Catholic health care facility is to create an environment of living and sharing the Gospel Message for the healing of the spiritual and physical, as well as the psychological, social, and emotional needs of the people we serve, in accordance with the moral and religious directives for the Catholic Health Care.